There's a lot of excitement this month about the planets aligning. 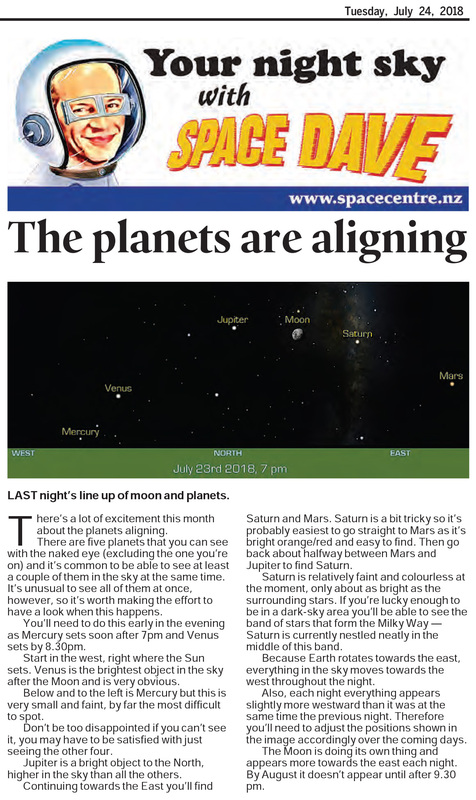 There are five planets that you can see with the naked eye (excluding the one you're on) and it's common to be able to see at least a couple of them in the sky at the same time. It's unusual to see all of them at once, however, so it's worth making the effort to have a look when this happens. You'll need to do this early in the evening as Mercury sets soon after 7 pm and Venus sets by 8:30 pm. Start in the west, right where the Sun sets. Venus is the brightest object in the sky after the Moon and is very obvious. Below and to the left is Mercury but this is very small and faint, by far the most difficult to spot. Don't be too disappointed if you can't see it, you may have to be satisfied with just seeing the other four. Jupiter is a bright object to the North, higher in the sky than all the others. Continuing towards the East you'll find Saturn and Mars. Saturn is a bit tricky so it's probably easiest to go straight to Mars as it's bright orange/red and easy to find. Then go back about halfway between Mars and Jupiter to find Saturn. Saturn is relatively faint and colourless at the moment, only about as bright as the surrounding stars. If you're lucky enough to be in a dark-sky area you'll be able to see the band of stars that form the Milky Way - Saturn is currently nestled neatly in the middle of this band. Because Earth rotates towards the east, everything in the sky moves towards the west throughout the night. Also, each night everything appears slightly more westward than it was at the same time the previous night. Therefore you'll need to adjust the positions shown in the image accordingly over the coming days. The Moon is doing its own thing and appears more towards the east each night. By August it doesn't appear until after 9:30 pm.